There are no shortage of disturbing stories in the news on any given day. Some more so than others. This is one of them. Communication in any family is paramount. Unfortunately, given the speed of life today, most of us perhaps don't have the time to dedicate to meaningful, consistent communication, especially with kids as they get older — like teens, who tend to withdraw naturally. Most teens would likely not see their parents as the first person to confide in. But they need to have options, especially with the range of issues thrust on young people these days — from bullying, cyberbulling, peer pressure, relationship-angst, social media concerns, depression…the list goes on. This time of year, especially, can be a tricky one in many families. The transition to back-to-school is fertile ground for anxiety, stress and worry. For kids and their parents alike. In seeking out experts to speak on this issue, I've run across plenty of sage advice, but one thought in particular that most parents and kids might overlook. Two words. BE PATIENT. We all want everything to work out smoothly from the get-go whether it's fitting in, liking a course, being accepted by new roommates at university, getting used to a new schedule, understanding a new course, accepting an empty nest, etc.. 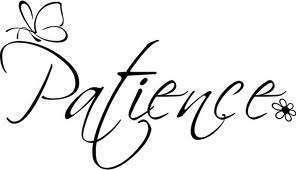 However, in our present world of instant gratification and band-aid parenting, it's often hard to be patient. We want to fix it instantly or at the very least minimize the discomfort no matter how trivial the circumstance. Patience teaches so much. More than most of us understand. It allows both parents and children to appreciate the process, accept the highs and lows and learn from them. It's not always fun, nor is it easy, but it is an important teaching tool no matter what the age. Communicating with children often requires huge helpings of patience. And when kids are in their tween and teen years, second and third helpings come in handy. In my interview with a counsellor from KidsHelpPhone, it became abundantly clear that many of the thousands of kids who access this free, anonymous and confidential service do so because they need someone to listen to them. Someone with the patience to listen carefully and not judge. Who knows what might have saved this clearly disturbed teen boy from taking his own life and that of his best friend. He seemed to leave a trail of fairly obvious hints as to his sad and depressed state — even on his Facebook page. His best friend, the girl he allegedly killed, seemed to listen to his pleas for help. What's truly sad is that when she sounded the alarm for him—no one seemed to listen.